which are running under the shadow of government of India. UPSC every year conducts this Engineering Services Examination for the recruitment of the candidates to the sectors of railways, manufacturing, roads, defense, inspection, supply, power, construction, public works, electrical, telecommunications, etc. There are huge numbers of engineering graduates are applying every year to attend the IES Examination. Indian Engineering Services are known as Group A Services that meet the industrial standards of Government of India. Last date for applying this UPSC IES Examination is 22-10-2018. For more details regarding this UPSC Indian Engineering Services Examination 2018 please see the details given below. UPSC has been released notification to recruit the Engineers for various organizations which are running by government of India. 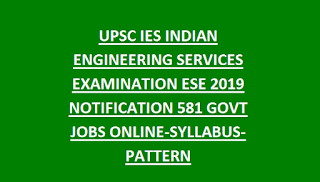 There are total 588 Engineering posts are available in the current recruitment of UPSC Engineering Services Examination. Eligible candidates are suggested to apply online on or before 22-10-2018 through the official website of UPSC at www.upsc.gov.in. 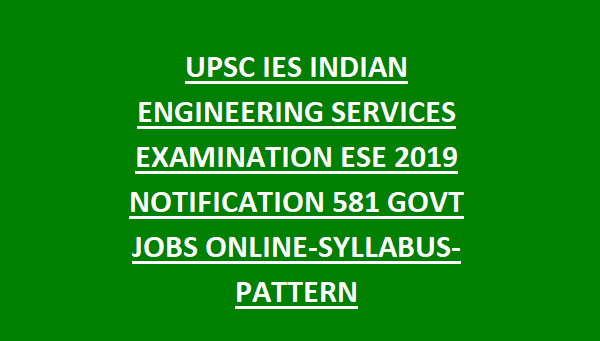 Click here to see the official notification of UPSC Engineering Services Examination.. Nature of work may vary based on their engineering discipline. IES officer will be moved to any organization, agency, department and ministry of the Government of India on deputation. After completion of five years of service they will be transferred to their parent cadre. UPSC Engineering Services Examination will be held based on the four categories of engineering disciplines only. · Indian Railway Stores Service. · Indian Telecommunication Service, Group ‘A’. As on 1st January 2018 age limits are 21-30 years. And age relaxation is applicable for the reserved candidates as per government of India norms. A Bachelor degree of BE/B.Tech in Engineering from any recognized university or Associate Membership of Institution of Engineers (India) i.e., A.M.I.E., or M.Sc degree from any recognized university with Electronics, wireless communications, Radio Physics or Radio Engineering as Special subjects also acceptable. The candidates who are appearing for the final year they are also eligible to attend the exam but at the time of interview he/she must have qualified the course and shown the originals. Candidates (excepting Female/SC/ST/ PH who are exempted from payment of fee) are required to pay a fee of Rs.200/‐ using credit/debit card or net banking facility or SBI and its associate banks. Those who are selected the option "pay by cash" they have to take chalana printout and pay the next day itself any State Bank of India Branch. Click here now to download the UPSC Indian Engineering Services Examination exam syllabus. Indian Engineering Services recruitment will be in four stages. It is known as Engineering Services Examinations (ESE). Most of the toppers of this exam will came from IIT's only. First stage (Preliminary Exam) consists of 2 papers. Paper 1 for 200 marks with 2 hours Objective type exam on day one to check General Ability of a candidate. This exam syllabus consists of General English and General Studies. Paper 2 is allocated for the Technical Paper objective type..
Paper 2 consists of 300 marks with 3 hrs of duration. The stage 3 is belongs to the Conventional Technical Papers of Subject Related ( Paper 1 & Paper 2). Each paper duration is 3 hours. Each Paper consist maximum of 300 marks. Those who are cleared the objective mode exams their papers only valued in third stage. This stage is belongs to Personality test. Those who are cleared all the 3 stages will be eligible for personnel interview. The interview will be based on the General Knowledge of their own state or country as well as in modern currents of thought and new discoveries. The eligible candidates has to apply through online only at upsc.gov.in. Before applying online please read the official notification and user instruction to apply. Must provide a valid email id and mobile number for further communication with the UPSC. Click here to apply online for UPSC IES Examination 2018.. This is all about Indian Engineering Services Examination recruitment notification 2018. Please share this information to your beloved friends via the social networking sites.